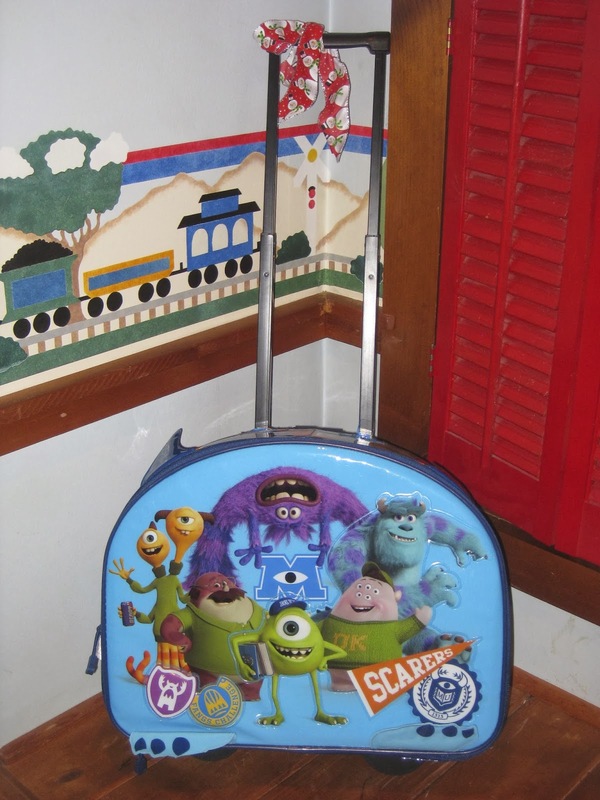 In honor of Monster University at the Annie Awards tonight, here is another surprise item that my parents got me for this past Christmas...the Disney Store exclusive Monsters University Rolling Luggage! You're probably thinking, "wait a second... wait a second, I know you collect toys, but aren't you a little old to be wheeling around Pixar luggage like this?" Yes I am, you're absolutely right. I actually got this to save to give to my kids someday. Being a fan of MU, I'm so happy I got this since it won't be around for much longer. It definitely won't be around by the time my kids are old enough to use it! I really love the design of this and all the details all over...including the decorative horns and the feet that stick out off the luggage! The outer material is a soft, shiny, vinyl-type plastic material. The handle is of course retractable, features rolling wheels and includes a top carry strap. Inside there are two interior sections divided by zippered lining. In case you're wondering how big this thing is, the luggage itself (not counting the handle) is 14" high and 18" wide. Additionally, like most luggage, there is a window pocket/ID tag just in case this luggage needs to be tracked down. If you have a little MU/ Pixar fan at home and are interested in getting this for them for your next family vacation, now would be the time to get it before it's gone! It is marked down on the DisneyStore.com for only $14.99. What was also SO cool was what was inside this when I opened it for Christmas. There was Pixar in Concert tickets (which we attended at the beginning of January, you can read my full write up of that here) and a little toddler size MU Oozma shirt (which I will post about soon). I was so excited! A big thanks to my parents for this thoughtful present! I'm really happy I have it. If you're interested in more of my collection, come back daily! In the mean time, you can explore my previous posts by using the organized labels to the right. Thank you so much for visiting and please comment if you have any questions! Good luck to Dan Scanlon and the entire incredible team tonight! I really hope you take the award home...no other animated film deserves it more! Update: One final note-On the amazing Pixar Post Forums (over at Pixarpost.com), if you haven't registered there, definitely get involved! ), there is a new post from my wife Brita who would like YOU to vote for your "Favorite Pixar Couple"in celebration of Valentine's Day coming up! Get festive this February and vote here.